There's something to be said for following your passion and inspiring others to do the same. Those who serve as inspiration should, too, also be inspired. All of life seems to be centered around the energy of giving and receiving and if done correctly, the journey is an incredible one. My brother-in-law Peter A. Richardson, PAR, is a damn good photographer. Two of his images were used as the front and back covers of my second novel, Never Said It Was Easy; additional images were used in the book trailer. 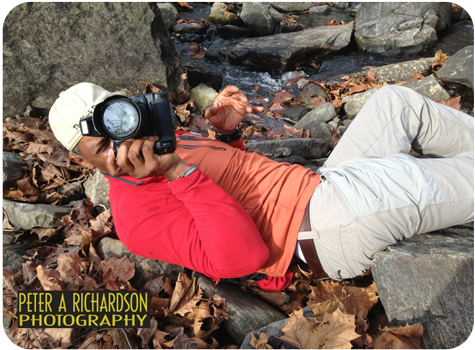 When you're willing to lie down on a bed of rocks, among the leaves, dirt and crawling critters just to get the right shot ... it is a passion. Each time PAR sends an email with a new image, I'm amazed at how something that seems so ordinary appears to be anything but when seen from the perspective of the photographer. The photos allow for a pause ... to reflect, appreciate and recognize the beauty in each. Well, brother-in-law has launched a website showcasing his phenomenal gift for capturing and viewing life from a different perspective. Visit the galleries. If you fall in love with any prints, you can order in the format and size of your choosing. Although I have an inkling of what I'd like to see for the front and back covers of my third novel, I'm waiting to see what else he captures. Some photo(s) may speak directly to the characters and my choice will be made for me. One thing I do know, PAR and I will be creating companion books featuring his evocative images spanning the glossy pages from top to bottom, left to right with excerpts from the novels in the Experience Life from a Different Perspective series. Exciting times! And wait ... did dude really name one of the galleries 'Wood'? Now that's funny! Check out the photographer in action.